Sticky, messy energy gels are outdated these days. I’ve always liked gels, but the new gummy candies are so much easier and more fun to eat! 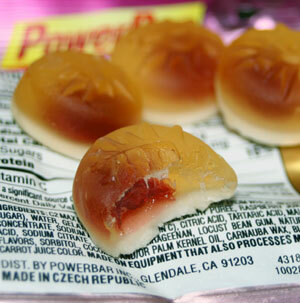 One of those candies is PowerBar Gel Blasts, a gummy candy with a liquid gel center. It’s sort of like a gummy bear with a liquid center. C2 MAX ENERGY BLEND (SUGAR, GLUCOSE SYRUP FROM WHEAT, INVERT SUGAR), WATER, GELATIN, 2% OR LESS OF: RASPBERRY PUREE, RASPBERRY JUICE CONCENTRATE, SODIUM ASCORBATE (VITAMIN C), CITRIC ACID, TARTARIC ACID, MALIC ACID, SODIUM CITRATE, GLYCERIN, CARRAGEENAN, LOCUST BEAN GUM, NATURAL FLAVORS, SORBITOL, COCONUT AND/OR PALM KERNEL OIL, CARNAUBA WAX, BLACK CARROT JUICE COLOR. And my usual warning applies: This snack is only to be eaten while partaking in endurance sports, such as bicycling. The two older flavors I tried are cola and lemon (apparently now discontinued,) while the two newer flavors I tried are strawberry banana and raspberry. Cola – The first thing that popped into my mind was those “Bottle Caps” candies. These taste a lot like the cola flavored “Bottle Caps” candy. They’re not exactly the same, but very similar. I don’t drink cola, but I liked these gel blasts quite a bit. They were almost too good though; they’re tempting to eat while sitting around off the bike!! Cola contains 50mg caffeine per serving. Lemon – This one has a lemon taste. It’s not bad, but not as good as cola though. You know how a lot of people will eat a bag of candy like Starburst or whatever and leave all the yellow ones? Well, if you would do that, don’t buy the lemon flavor. Raspberry – Raspberry smells and tastes like expected. A fairly natural flavor, but obviously not as real as eating a raspberry. It’s similar to, if not exactly the same as, your average raspberry energy gel. 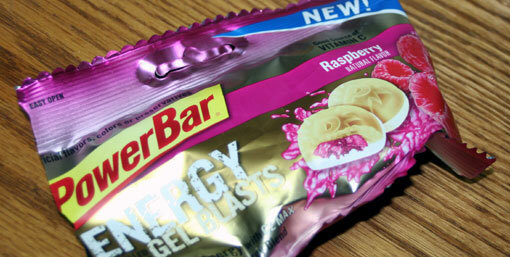 That said, I’m a big fan of raspberry gels and this did not let me down! I was so excited to test these, I probably ate a dozen packets as snacks before even trying them out during rides! So I tried these out at snacks, during rides, and during xc skiing. When it comes to ease of use, these can’t be beat! They’re so versatile. For example, you can eat a whole packet at once, or you can ration them out over the course of an hour. (Rationing regular bars and gels is possible, but not nearly as convenient.) You can also chew them up for a quicker sugar rush, or let them dissolve in your mouth like hard candy if you’re on a leisurely ride. Note: The whole “bite into them and release the liquid center for quick energy” idea is completely false. The gooey center is about the size of a headset bearing, and it’s not liquid. It’s much thicker than energy gel and a little softer than the rest of the gel blast. Put simply, you can bite the thing in half and nothing is going to ooze out. Since these are not sticky, your hands and lips stay very clean. Your jersey stays clean, too, since there’s no messy wrapper to stick back in your jersey pocket. There is nothing left sticking to your teeth either. As for the energy boost, I didn’t notice a huge energy boost, but at the very least, chewing on these gave me an uplifting feeling. So this is my new favorite way to get calories! 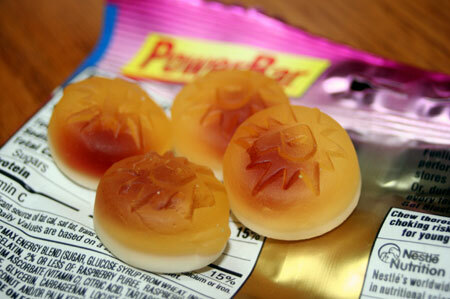 The Powerbar Gel Blasts taste good and are convenient and fun to eat. 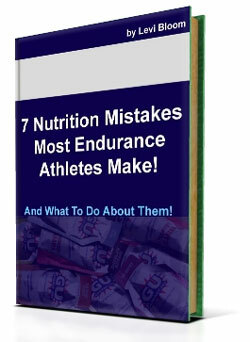 Definitely try these out if you’re sick of typical energy bars and gels! They make a perfect substitute.